In late 2009 we swapped our inner city courtyard for a 20-acre property in Macedon Ranges. Back in our city life years Tony made a joke each morning that, with coffee in hand, he would do a boundary ride of our 7 by 14 metre courtyard to check that all was well. Little did we know that our yearning for a country life would shift our gardening focus from a few minutes here and there to several hours each day – particularly on blistering summer days when our English garden struggles to handle the dry sweltering heat and hot northerly winds. As a novice gardener I had little comprehension of the level of labour that a country garden would require. I recall the first few months here at Hedge Farm spending hours weeding garden beds that had been neglected for years. The satisfaction I felt after many hours of back-breaking work was soon dampened by the rapid re-seeding and re-growth of weeds. I was amazed at how quickly they would return, particularly in spring, as the soil thawed and new warmth and rain spurred on new growth. Only after several years do I feel that I am on top of the garden chores. This is largely due to watering systems, mulching and better plant selection as well as having a closer connection to planting and a greater understanding of what gardening truly requires. My passion for gardening has only grown. The garden has become my place of solace and meditative work as well as providing wonderful spaces to share lazy summer evenings and brisk winter afternoons with family and friends. My greatest joy is our South Garden. Many years ago (the farm dates back to the mid 1800’s) this area on the south side of our house was the location for the farm’s dairy. At the time of our purchase it was a large desolate patch of weeds and old concrete paths – dry and hot on a summers day and cold and damp in winter. My plans for this space were to transform it into a place of beauty. String lines and wooden pegs outlined the paths and paved and gravel areas. Six hundred privet seedlings planted in sizzling heat and rock hard soil created green borders and mop top Robinias provided much needed visual height. All of these I used so as to make garden rooms and private seating spaces. Careful selection of hardy planting such as Euphorbia, Escallonia, Hydrangea, Camelia, Rhododendron, Hebe, Pittosporum and roses was needed in order for the garden to survive in shady, damp areas as well as the harsh winter frosts and long dry summers of the Carlsruhe area. I know this planting is not exotic but for a novice gardener it is important to know they will thrive here…. the older gardens here tell me so. 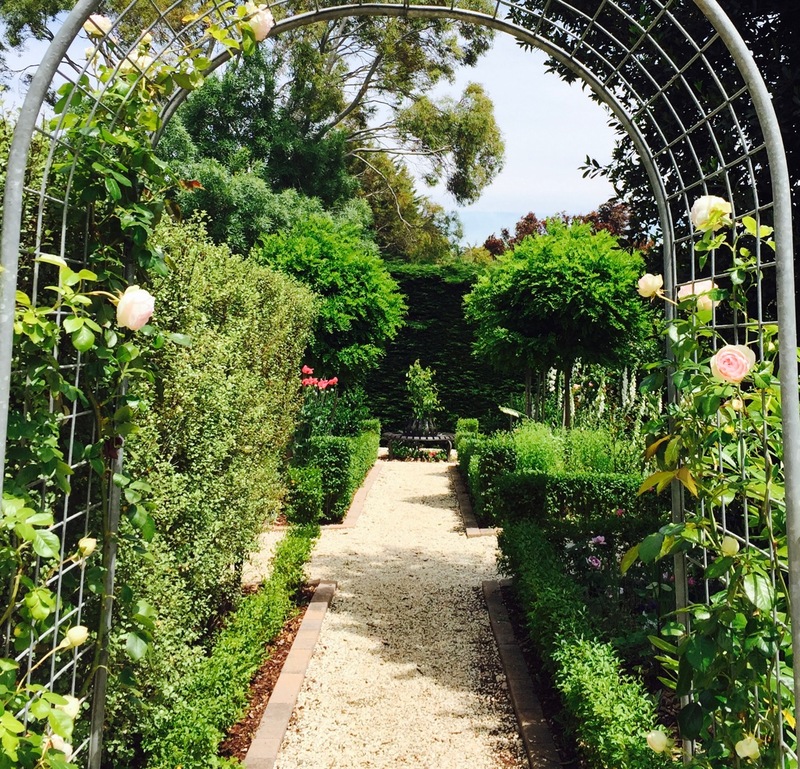 I am drawn to the South Garden on most days – even if it is just a walk through. It is still a work in progress, but I guess all gardens are. Although in our time here at Hedge Farm we have undertaken many projects to restore buildings and improve the old gardens, it is the South Garden that is my labour of love and most cherished project. It is my creation, and as it continues to grow and change I hope it is something that will be enjoyed long into the future. Gardens, after all, are a legacy.